Mur Lafferty (born July 25, 1973) is an American podcaster and writer based in Durham, North Carolina. She was the editor and host of Escape Pod from 2010, when she took over from Steve Eley, until 2012, when she was replaced by Norm Sherman. She is also the host and creator of the podcast I Should Be Writing. She was, until July 2007, the host and co-editor of Pseudopod. She is the Editor-in-Chief of the Escape Artists short fiction magazine Mothership Zeta. Lafferty attended the University of North Carolina at Chapel Hill and graduated with a degree in English. In 2014 she received her MFA from the University of Maine's Stonecoast program. Lafferty performing a live episode of the Ditch Diggers podcast at the 2017 Worldcon. A friend introduced Lafferty to podcasting in October 2004. She immediately seized on the medium as a novel opportunity to publish her essays on geekdom. Her first podcast, Geek Fu Action Grip, launched in December 2004. Early topics included her obsession with Alton Brown and her uncomfortable crushes on the hosts of her child's TV shows, and expanded to discussions of games, movies, and television shows. In later episodes she began podcasting her fiction, most notably her serialized novels Heaven and Heaven Part 2: Hell. Geek Fu Action Grip ceased production as of episode 103. 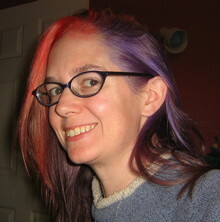 Lafferty's essays also led to her becoming an early contributor to Wingin' It: a sci-fi variety show podcast hosted by Michael R. Mennenga and Evo Terra. While she is no longer a regular, her essay produced during their 2006 Dragon*Con show is considered one of her best. In September 2006, Lafferty, along with Michael R. Mennenga and Tracy Hickman, founded the Parsec Awards, which recognize excellence in science fiction podcasting. After a general nomination period, the Steering Committee compiles a shortlist, from which an independent panel of judges selects the winner of each category. The awards are presented yearly at Dragon*Con. Lafferty's second podcast arose from her desire to share her experiences as a struggling fiction writer. I Should Be Writing is a self-described "podcast for wannabe fiction writers." Each show covers a specific topic about the writing world, from battling self-doubt to crafting queries and cover letters, interspersed with interviews with published professionals. I Should Be Writing won the 2007 Parsec Award for Best Writing Podcast. From May 2010 to December 2012, she was the editor and host of the sci-fi podcast magazine Escape Pod, taking over from former editor and founder Steve Eley. Under her editorship, Escape Pod began paying SFWA pro rates for the first time. Lafferty was also co-founder, along with Steve Eley and co-editor Ben Phillips, of Pseudopod, a spin-off of Escape Pod presenting "the best in audio horror." In July 2007 she stepped down as co-editor of Pseudopod. Mur Lafferty and Alasdair Stuart prior to the Hugo Awards ceremony in 2017. In January 2015, Lafferty started a new podcast with a recurring I Should Be Writing guest host Matt Wallace. The new show, titled Ditch Diggers, focusses on the professional and business side of writing and is intended to be honest to the point of brutality, in contrast to the more optimistic and uplifting tone of I Should Be Writing. It won the Hugo Award for Best Fancast in 2018, having been a finalist the year before. Lafferty's early career began with her writing for White Wolf and other role playing game companies, and she has expanded to writing about games for such publications as Scrye, Knights of the Dinner Table, Anime Insider, Games Quarterly, and The Escapist. Her popular podcast novel Playing For Keeps was published by Swarm Press on August 25, 2008. She has also written essays for the online magazine Grumble, many of which have ended up on Geek Fu Action Grip and published fiction in Hub magazine. Her short story. "1963: The Argument Against Louis Pasteur" (published in Ann and Jeff VanderMeer's anthology The Thackery T. Lambshead Cabinet of Curiosities) qualified her the John W. Campbell Award for Best New Writer, which she won in 2013. In May 2013, Orbit Books released the first in Lafferty's urban fantasy series: The Shambling Guide to New York City. It received favorable reception; Kirkus Reviews stated: "The hip, knowing and sometimes hysterically funny narrative, interspersed with excerpts from the guide of the title, lurches along in splendid fashion… The result is irresistible." The second novel in the series, A Ghost Train to New Orleans, was published on March 4, 2014. Tricks of the Podcasting Masters was named one of the top reference books for 2006 by Amazon.com. ^ G.D. Gearino (March 22, 2005). "Podcasting takes off". The News & Observer. p. E1. Archived from the original on April 5, 2005. ^ a b c d e f Hutton, Christopher (June 19, 2015). "Hall of Famers: Meet the Men and Women Who Changed Podcasting". Paste. Archived from the original on June 21, 2015. Retrieved March 23, 2017. She discovered podcasting in 2004 after hearing shows likes like Adam Curry's Source Code and loved how it opened up new opportunities for self-expression In 2005, Lafferty started her own podcast, titled Geek Fu Action Grip, where she expressed her love of geeky things in essay form. The podcast eventually evolved into a platform for Lafferty to share her books in serial format. Lafferty also joined the geek-centric podcast "Wingin It" as a contributor. Geek Fu Action Grip ended in 2007 after 103 episodes. Lafferty went on to write more books, as well as start her current podcast "I Should Be Writing", a show dedicated to exploring and practicing the writing craft. Lafferty was also the editor of EscapePod, a speculative fiction podcast for two years, as well as a cofounder of the Parsec Awards, a DragonCon-centric award show that's focused on science fiction podcasting. ^ "Escape Pod Metacast 5". Retrieved 3 June 2012. ^ "News- changes at Escape Pod- blog, reviews, text, and rate increase!". Retrieved 3 June 2012. ^ "The Shambling Guide to New York City". Kirkus Reviews. Retrieved 4 March 2014. ^ "Top Ten Savvy Women in Podcasting for 2006 Final List". Archived from the original on November 11, 2007. ^ Elise Ackerman (November 23, 2006). "Podcasts beginning to reach non-geeks". San Jose Mercury News. p. BU1. ^ "2007 Parsec Awards Winners & Finalists". Retrieved 3 June 2012. ^ "2008 Parsec Awards Winners & Finalists". Retrieved 3 June 2012. ^ "2010 Parsec Awards Winners & Finalists". Retrieved 3 June 2012. ^ "2011 Parsec Awards Winners & Finalists". Retrieved 3 June 2012. ^ "2012 Hugo Awards". Retrieved 3 June 2012. ^ "2013 Hugo Awards". Retrieved 10 June 2013. ^ "Mur Lafferty - The Ghost Train to New Orleans cover art reveal". Upcoming4.me :. Archived from the original on 15 June 2013. Retrieved 6 May 2013. ^ Brazil, Nathan. "The Thackery T. Lambshead Cabinet of Curiosities: A review". Sfsite. Retrieved 2012-11-15. ^ "FAQ". Mothership Zeta. Retrieved 10 December 2016. This page was last edited on 6 March 2019, at 05:08 (UTC).